Udaipur is a major city, municipal corporation and the administrative headquarters of the Udaipur district in the Indian state of Rajasthan. It is the historic capital of the kingdom of Mewar in the former Rajputana Agency. Maharana Udai Singh of the Sisodia clan of Rajput founded the city 1553 and shifted his capital from the city of Chittorgarh to Udaipur. It remained as the capital city till 1818 when it became a British princely state, and thereafter the Mewar province became a part of Rajasthan when India gained independence in 1947. 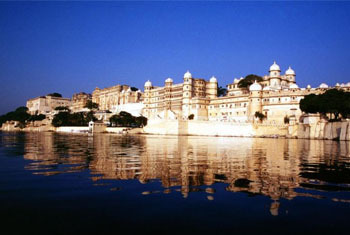 Udaipur is a very popular tourist destination. Known for its history, culture, scenic locations and the Rajput-era palaces, Udaipur was also voted as the best city in the world in 2009 by the Travel + Leisure magazine. Udaipur is a beautiful city, set amidst the Aravalli Ranges of Rajasthan, India. Known for its picturesque lakes, Udaipur also called 'the city of lakes'. The elevated hills and the beautiful lakes make a picture-perfect backdrop to the Udaipur city. 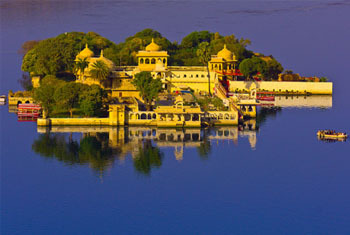 Udaipur is regarded as one of the most romantic cities of the World and subsequently, also known as the 'Venice of East'. 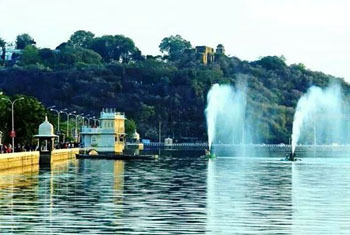 Fateh Sagar Lake is the second artificial lake of Udaipur, the first being Jaisamand Lake. Located in the north of Lake Pichola, Fateh Sagar Lake lies just besides the entrance to Moti Magri Hill. Built in 1678 by Maharana Jai Singh, Fateh Sagar Lake got its name from Maharana Fateh Singh, who later made additions to it. The lake extends to the length of 2.4 km, 1.6 km. in width and deep to the extent of 11.5 meter. During the monsoons, the lake covers the total area of around 1 sq km. 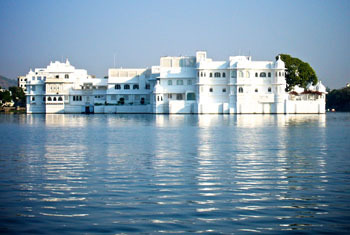 Jag Mandir Palace located on the southern island of Lake Pichola. The three-storied palace built in early years of 17th century is a palatial structure made in yellow sandstone and marble. Lake Palace is one of the most romantic Places on this earth, situated amidst the scenic Pichola Lake offers a heavenly view to the on looker. The imposing Aravalli Hills on one side and soaring palaces on the other, make the perfect background to this beautiful Lake Palace. Raised in white marble, Lake Palace was constructed by Maharana Jai Singh II in 1746. The magnificent Palace stretches across a four-acre island creating a dream-like impression. City Palace is the largest palace in Rajasthan, located on the eastern shore of Lake Pichola, it is a massive fortified structure, presenting an amazing blend of Rajasthani and Mughul architecture covering an area of 5 acres. The Facade of the Palace resembles a fortress. The halls and courtyards of the Palace's older section are linked by narrow passages and steep stair cases. The Tripolia gate and the Ganesh Deorhi gate are the major gates of the City Palace. 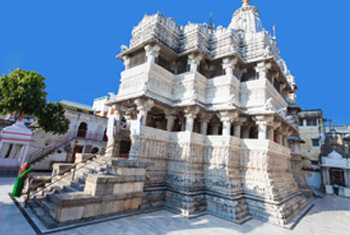 Jagdish Temple is one of the famous temples of Udaipur made in Indo-Aryan style of architecture in the year 1651, was built by Maharana Jagat Singh, who ruled Udaipur during 1628-53. The temple is dedicated to Lord Vishnu (Laxmi Narayan), the preserver of the Universe. It is celebrated for being the largest temple in the city of Udaipur. The gateway of this temple can be sited at a distance of 150 meters from the Bara Pol of the City Palace. .
Sahelion Ki Bari "Garden of maids" is a major tourist destination in Udaipur. The garden is famous for its lush green lawns, marble art and fountains, presenting a green retreat in the dry lands of Rajasthan. 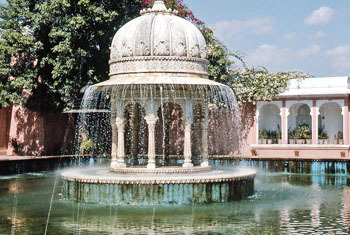 Garden of maids was built in the 18th century by Maharana Sangram Singh for the royal ladies.